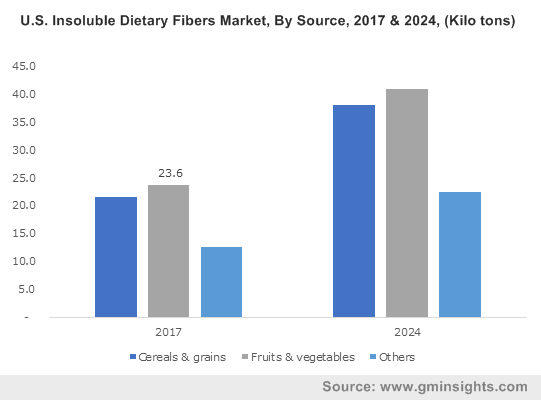 Global Insoluble Dietary Fibers Marketsize was worth more than USD 2 billion in 2017 and is anticipated to witness CAGR over 9.5% up to 2024. Strong outlook in nutritional supplements and food & beverage applications along with necessity to enhance nutritional content in food is propelling the insoluble dietary fibers market growth. Growing consumer spending on food & beverages coupled with increasing awareness on food safety & hygiene will support the industry growth. As per Gulfood, in 2017, Asia Pacific displayed the highest consumer expenditure on food & beverages accounting for USD 562 billion, followed by North America. Expanding bakery industry owing to shifting consumer preferences towards packaged fast food is fuelling the market size. High product scope as cholesterol reducer, calorie reducer, immunostimulant and bowel movement regulator will positively influence the industry demand. Technological advancement and product innovations with varying solubility has enhanced the business growth. Comprehensive functional properties including efficient water binding, gelling, stabilizing, and thickening will propel the insoluble dietary fibers demand. Increasing usage as water binding ingredient in meat products will escalate the application scope. Rising product demand as gelling agent in confectionery & snacks will fuel the industry demand. Fluctuating raw material costs due to changing agricultural trends may impact the price trend. Increasing prevalence of gastrointestinal diseases owing to aging population & unhealthy diet will fuel the business demand through nutritional supplements application. Rising personal healthcare spending accompanied by growing consumer awareness regarding product benefits will drive the market. However, gases formation in the digestive tract due to irregular dosage causing discomfort & bloated stomach can restrain the product demand. Insoluble dietary fibers market from cereals & grains was valued more than USD 900 million in 2017. Oats, wheat, bran, rice, and corn are among the major grain sources. Abundant & easy availability along with cost-efficient properties will create notable gains in forecast period. According to FAO, China, India, Russia, U.S., and France are among the major wheat producers. Insoluble dietary fibers market from fruits & vegetables will witness CAGR at around 8.5% from 2018 to 2024. Rising citrus based product demand owing to wide functional properties and application scope will propel the industry growth. High fiber content in fruit peels and vegetable wastes coupled with shifting trend towards fruit-based products will support the application scope. Cellulose dominated the insoluble dietary fibers market share, accounting for over 30% in 2017. Extensive sources including whole grains, root vegetables, apple & beans coupled with significant health benefits including prevention from constipation will support the product demand. Rising demand from bakery, dairy & nutritional supplement applications due to suitable functionality & high nutritional content will propel industry growth. Innovations in cellulose & cellulose derivate applications including controlled release and taste masking of drugs has enhanced adoption rate in extended release tablets and capsules. Bakery applications are estimated to generate over 100 kilo tons demand by 2024. Increasing product adoption as fat replacers in bakery will enhance the industry demand. 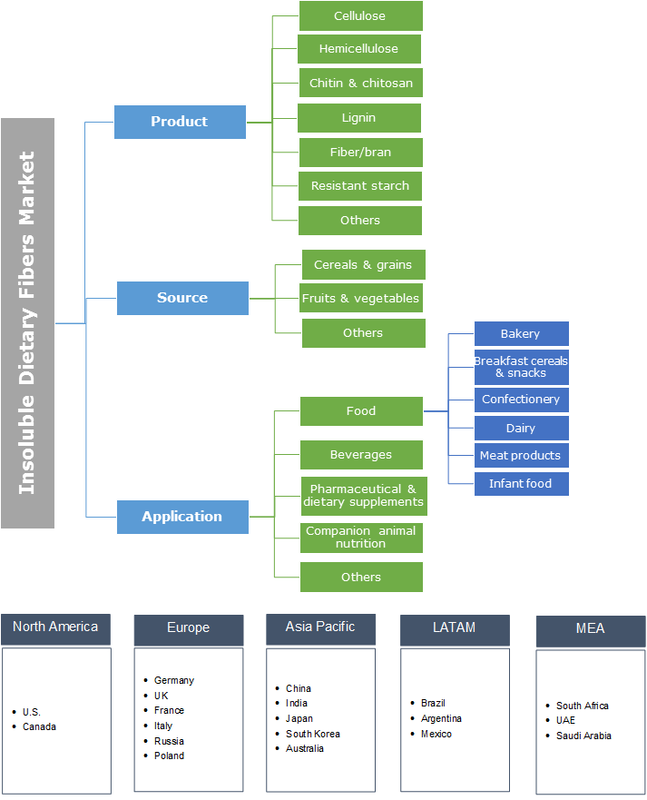 Augmenting bakery industry owing to growing demand for ready-to-eat products accompanied by busier lifestyle is stimulating the insoluble dietary fibers market size. German bakery industry accounted for over USD 15 billion in 2016. Expanding count of bakeries, growing urbanization, rising disposable income, along with increasing government initiatives towards improving the nutritional content in food will drive the product penetration. Dairy applications will witness CAGR at over 9% up to 2024. Rising demand for nutrient rich yogurt, milk & other dairy products has stimulated the industry growth. Strong outlook as fat replacer and thickening agent in dairy applications will drive the insoluble dietary fibers demand. Presence of mature dairy markets particularly in Europe and Asia Pacific will support the industry demand. North America market revenue was valued at over USD 900 million in 2017. Increasing health concerns including rising obesity & gastrointestinal disease incidences owing to inapt food habits in the region is paving the way for product demand. Increasing nutritional supplements demand accompanied by rising healthcare spending per capita are among key factors supporting the regional growth. Increasing consumer focus on healthy food coupled with rising ready-to-eat products demand is stimulating the industry growth. Europe market will witness growth over 8.5% up to 2024. Potential market for bakery & processed food products is among major factors driving the industry demand. Shifting consumer preference towards highly nutritious food along with regulatory compliance will support the regional demand. Global market share is highly fragmented with presence of large number of regional as well as multinational manufacturers. Major players include Cargill, Roquette Freres, Tate & Lyle, J. Rettenmaier & Sohne Gmbh & Co, SunOpta, Ingredion Incorporated and DuPont Danisco. Other prominent companies include Solvaira Specialties, Grain Processing Corporation and CEAMSA. Plant capacity expansion, mergers & acquisitions, distribution channel expansion to enhance revenue share are among the key strategies adopted by the manufacturers. For instance, in 2017, Roquettes Freres opened a new headquarter in Asia Pacific focusing on food & nutrition segment in the region. The other globally observed strategies among major players include R&D spending to enhance the application scope. Substantial growth in bakery, dairy, and nutritional supplements industry along with stringent government food labelling regulations to enhnace consumer awareness will proliferate the industry demand. Rising demand for healthy food owing to increasing health concerns and growing medical treatment expenses will support the business growth. Dietary fibers industry is governed by technological advancements and innovations to improve product functionality. Significant health benefits coupled with increasing raw material production are among the key factors driving the industry growth. Reduced chances of various diseases including diabetes, diverticulitis, constipation, coronary heart diseases, and obesity provides positive outlook for product demand. Government and other related organizations play a vital role in stimulating global demand through recommendations and policies. High adoption rate owing to increasing product launches for different applications and varying properties is propelling the business revenue.